When cleaning up the yard this spring I actually contemplated retiring this old planter. If I move it the bottom is going to literally fall out. 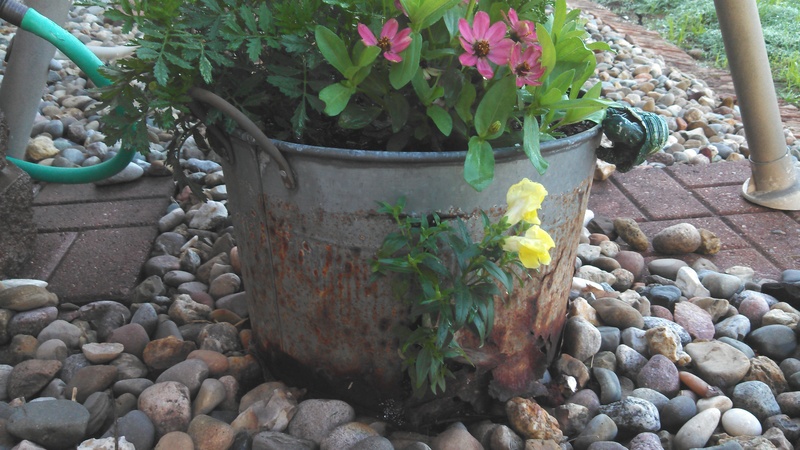 Actually finding beauty in the rusty decay of this small metal wash basin, I decided to try to make it last at least one more year. As the weather grew warmer a green sprout started to grow from one of the large rusted cracks. It didn’t really resemble a weed so I made the resolution to wait and see what the green sprout grew into. Much to my delight it is one of the annuals I had planted last year. How exciting it has been to watch the bright yellow puffy blooms from last year appear completely unplanned by me. There was enough of a remnant of a root or possibly a seed that survived a harsh winter in this old decaying pot. As I have watched this plant bloom from the brokenness of my old planter it has made me think a lot about our broken messed up lives. No one can escape life’s trials as we all have them. Sometimes it is the consequences of our own choices causing our wounds. Sometimes it is the choices of others that wound us. Then add life’s normal progression of losing loved ones. Learning that this world we live in is not fair is an addition to our brokenness. The amazing thing is that before God even created the world He had each and every one of us planned. Within each of us He planted a seed of His glory. When that seed becomes rooted in Jesus, God’s only Son, there is a beauty that blossoms out of our brokenness. As we turn our broken lives completely over to Jesus’ love and forgiveness. When we turn from our sin and set our eyes on Him. The seed of God’s glory that He planned so long ago becomes rooted in Jesus. That seed then begins to grow and to blossom. As we allow His purpose and plan for our lives to play out there is a beautiful peace that is beyond description. God can turn any ugliness of our lives into beauty. No one is too broken or messed up that God cannot bring life and hope from the deepest of wounds. Eventually this pot will have its final day and will no longer be able to stand. As our bodies will one day take the final breath. It is at that time that if our seed is not rooted in Christ that it dies, forever separated from God. Until our final breath we have the opportunity to accept Jesus and become firmly rooted in Him. What a lovely post, thank you. The Japanese have a kind of art where they repair the cracks in pottery with gold fillings.The more broken, cracked, and aged the piece is, the more beautiful it becomes. It’s in that brokenness that the real artistry of the piece starts to emerge. God has a way of doing that same kind of work with people. He most definitely does. Thank you so much for your comment! !